Organized as a mission in 1863, Masses were offered periodically by “missionary circuit riders” in the homes of people in Woodstock and North Lewisburg. With some growth in sight, interest was sparked to establish a permanent site for a parish in the northern part of Champaign County. Ground for the church was donated by Patrick Moran and his wife. They were among a group of Irish immigrants who followed the railroad to the North Lewisburg area, purchased parcels of land, and began farming. A frame structure was built under the pastorate of Fr. Nicholas Young. 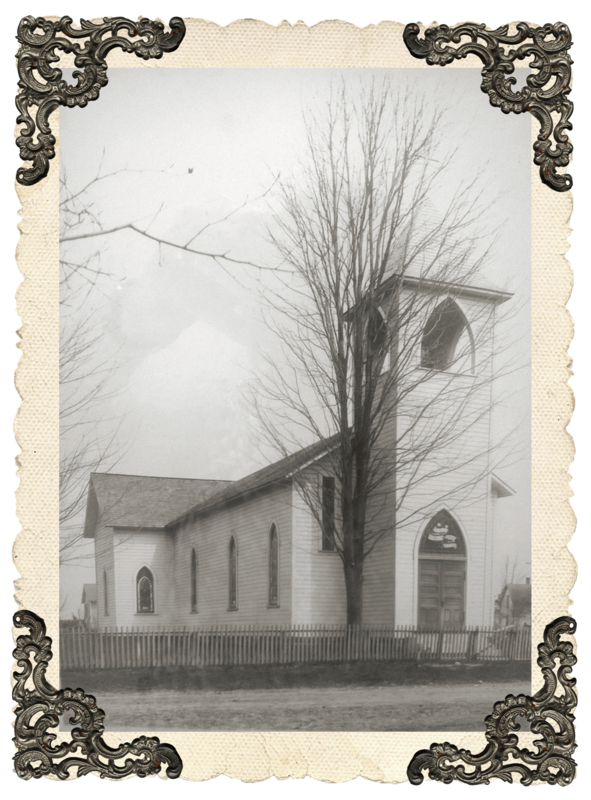 The church was completed in 1869 (the same year the cornerstone was laid), while the Morans’ home, presently owned by Virginia Reid, wasn’t completed until the following year. The church’s foundation is of unmatched stone gathered from the land. The church is a tall frame structure, smaller than many homes, and perched on the edge of Elm Street on the way out of town. Insider are 11 pews, with aisles only on either side, and stained glass windows memorializing the founding families: the Morans, Dolans, Benedicts, Landes, Burkes, and John Shea Sr. Other windows were in memory of Archbishop William Henry Elder, living/deceased members of the Altar Society, Rev. John Venneman and Rev. Nicholas Rohden. According to Fr. John Wolbert, pastor from 1987 to 1993, the church’s bell tower came from Mt. St. Mary’s major seminary, when it was in Price Hill (on Cincinnati’s west side — sometimes referred to as “God’s holy mountain”). Until 1942, these churches were administered by the priests from the nearby town of Marysville. Although Marysville was part of the Columbus diocese, the parishes were attached to Marysville as mission churches. After 1942, the Archdiocese of Cincinnati began to assign priests to pastor St. Michael’s in Mechanicsburg and Immaculate Conception in North Lewisburg. As many parishes might record in their histories, Immaculate Conception parish has had its share of colorful pastors. The virtue of charity has been the blessing most of them have received from their flock, but some attest that a few of them “were difficult.” Most, therefore, scored flowers in the hearts of those they served, and find themselves endeared in memory. Celebrating our 125th anniversary in 1994, Immaculate Conception Parish rejoices for the great faith that has been shared by so many people in its history. In thanksgiving to our Almighty God, we continue to place our lives at the service of the Gospel, and to live as His people. Drawing our strength and encouragement from the Blessed Mother, we strive to imitate her trust and to live as fully aware of our weaknesses, as we rely on the grace we received in our redemption. 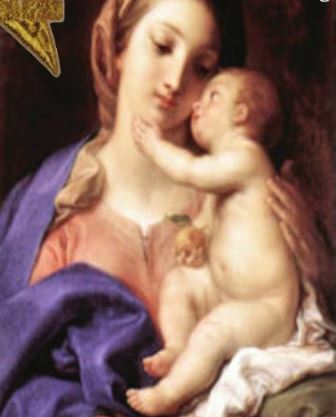 Mary, conceived without sin, pray for us!. Shortly after his arrival, Fr. John Berning (1950-1953) received permission to keep the blessed sacrament received at Immaculate Conception Church. He obtained the tabernacle that is now used. In recent writings, Fr. Berning states that he still holds dear the joys of this assignment, and cherishes the fine people. At 87, Fr. Berning enjoys hearing from those he served and loved so well. Fr. Lonsway received the old pews from St. Mary’s Church in Urbana, along with the ceiling lights. These items brought about a renewed look at Immaculate Conception. About this time also, the stations of the cross from St. Michael’s were put up when he received the stations from the chapel at Mercy Hospital. This was a time for seeking some cleanup and fix up energies. An ice cream social and flea market were undertaken to raise additional funds to make needed repairs on the church. Some local publicity opened the generous hearts of people near and far. Donations came in various sizes from wood carvings to a set of steel-plated front doors. Insulation and new siding were put on the church, and the church was warmed inside and out. Our thanks to all who helped make needed repairs and improvements!